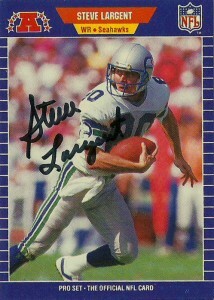 I went ahead and sent out to Steve Largent TTM in 2011 since I got his autograph way, way, back in the 1990s at a conference in Austin. After working with a Christian Athlete’s association Steve went into politics in Oklahoma where he was elected on his conservative record to Congress. He ran for governor of Oklahoma but lost narrowly in a highly contested election. Since that time Steve has retired back to the Seattle, Washington area where he has worked as president of CTIA, – a wireless lobbying firm. I sent off to him in late May and was happy to get his autograph back on this Pro Set 1989 card. Unfortunately he only signed 1 of 2 cards- ignoring the 1978 Topps I also included. Still, I am happy to have reacquired Steve for my collection on this Pro Set 1989 card, which frames him in action flawlessly.